This is a short series of articles that will discuss various methodologies to value BDCs. Over the last two months BDC investors have retreated to safety leaving many companies undervalued. 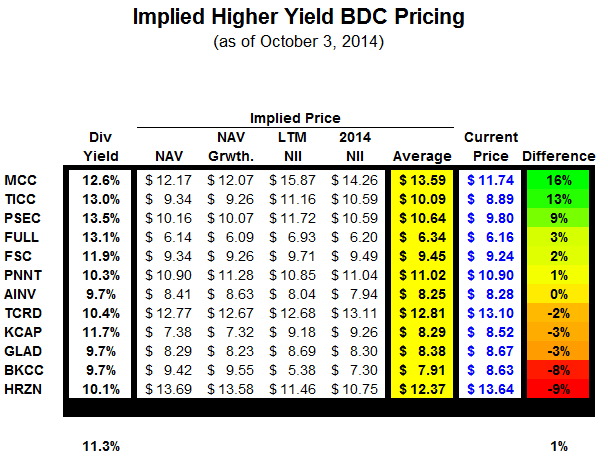 This article focuses on which higher-yield BDCs are the most attractively priced. Valuing BDCs includes a range of multiples applied to net asset value ("NAV") per share and core net investment income ("NII") as well as expected returns. Recently BDC prices have been under pressure, most likely related to the overall market and economy. The health of the BDC portfolio is critical when determining pricing because it drives NAV and cash flow coverage of the dividend, both of which are key factors in determining returns for shareholders. The following table shows the stock performance of BDCs over the last two months with only a handful in positive territory and the average BDC down around 5%. Hercules Technology Growth Capital (NYSE:HTGC) is an outlier from a 'flight to safety' view and has dipped more than the others. The stock appreciated more than most and was up 25% after the last pullback when BDCs hit a low in May 2014. HTGC is one of the only BDCs that is still priced at a 10%+ premium to its 52-week low. Many of the higher yield BDCs are near their 52-week lows including Fifth Street Finance (FSC), Medley Capital (NYSE:MCC), THL Credit (NASDAQ:TCRD) and TICC Capital (TICC) that are all within 2% to 3% of hitting new lows. 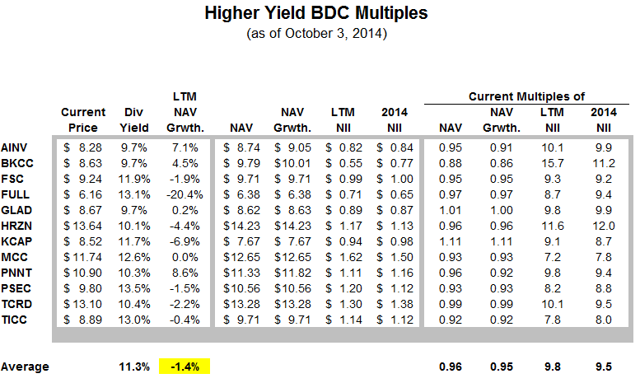 The following table shows the multiples for the higher yields BDC with only KCAP Financial (KCAP) still trading at a meaningful premium to NAV per share and most likely related to being the only internally managed high-yield BDC. Using the average multiples in the previous table would imply that there are three of these companies underpriced relative to the others: MCC, TICC and Prospect Capital (NASDAQ:PSEC). Most of the others are almost perfectly priced given the current multiples with the exception of BlackRock Kelso Capital (NASDAQ:BKCC) and Horizon Technology Finance (NASDAQ:HRZN). As discussed in "BKCC: BDC Risk Profiles", I have adjusted BKCC's risk profile from 2.5 to 3.5, implying a safer risk profile due to the recent dividend cut and the company deciding to invest in higher quality assets rather than reach for yield. Some BDC investors are less focused on getting the highest dividend yield and paying the lowest NAV multiple. These investors most likely have BDCs as a larger portion of their overall portfolio and are focused on capital preservation especially during an economic downturn. I believe this is why these investments have outperformed the others over the last two months. Most of these companies have much lower portfolio growth rates, better coverage of dividends, pay special dividends, lower fee structures or are internally managed, higher NAV growth and invest in higher quality assets with less need to reach for yield. 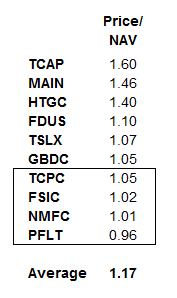 Most of these BDCs trade at a premium to NAV and are less likely to issue shares. I believe that investors base valuations of these BDCs on risk adjusted returns as well as operating history and the trust level of management. I will cover this in Part 4. However, NAV per share will always be a measure of value and the following table shows the current multiples for some of these BDCs. Two things that investors will always pay a premium for are internally well managed companies and the ability to use higher leverage through an SBIC license. HTGC, Main Street Capital (NYSE:MAIN) and Triangle Capital (NYSE:TCAP-OLD) are the three BDCs with both but some of the other BDCs with SBIC licenses are Fidus Investment (NASDAQ:FDUS), Golub Capital BDC (NASDAQ:GBDC), New Mountain Finance (NYSE:NMFC) and TCP Capital (NASDAQ:TCPC). NMFC and TCPC recently received their licenses and have plenty of leverage availability. As discussed in "TSLX: Risk Profile", TPG Specialty Lending (NYSE:TSLX) currently has one of the lowest debt-to-equity ratios in the industry giving it less need to reach for yield than most BDCs. The rest of this series will cover many of the key items related to pricing and evaluating the potential for dividend coverage/cuts and NAV growth/declines as well as updating my "BDC Research Page". For more information on specific BDCs please visit my "Index to BDC Articles". Disclosure: The author is long NMFC, MAIN, PFLT, FSIC, HTGC, ARCC, TCPC. The author wrote this article themselves, and it expresses their own opinions. The author is not receiving compensation for it (other than from Seeking Alpha). The author has no business relationship with any company whose stock is mentioned in this article.